The Yakezie Alexa Challenge -- I'm All In! The Yakezie Alexa Challenge — I’m All In! It’s hard to believe, but Rainy-Day Saver will be celebrating its 2-year anniversary in MAY. I first started this blog as an outlet for my thoughts about finance and personal going-ons, but it’s evolved into so much more — a community of great readers and fellow bloggers. Thank you so much for reading — I hope you enjoy reading these posts and much as I enjoy writing them! Sam over at Financial Samurai has come up with an excellent promotional challenge to help us personal finance bloggers really move up in the rankings — the Alexa rankings, to be exact. 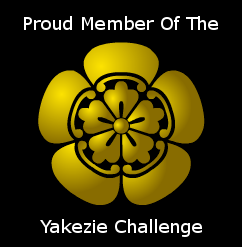 The Samurai Yakezie Challenge is a way for bloggers to go from average to extraordinary. I decided to enter Rainy-Day Saver into the challenge, aiming to breach the 200,000 mark in Alexa rankings. Many other fantastic bloggers are in on the challenge; I hope to post a list mentioning each one individually by next weekend. Since joining a few short weeks ago, Rainy-Day Saver was originally ranked 1,305,476 but has shot all the way up to 944,782! While these are still what my father would call “telephone numbers,” I think it’s a pretty good sign that RDS is moving up the charts and into people’s hearts. Much thanks to Daniel at Sweating the Big Stuff for tracking all of the stats in his nifty charts, Eliminate the Muda for creating the sweet Yakezie Challenge badges, and Sam at Financial Samurai for getting us all super-motivated! 8 comments to The Yakezie Alexa Challenge — I’m All In! @Mrs. Accountability: Thanks for the kind words (and for trying to help with my coding woes). Good luck with your blogging, also! Wow! Right now you're at 600,109! Moving on up! I wanted to thank you personally for the tweet you sent one day… it wasn't about the Yakezie Challenge… it was actually when you were having trouble with the coding on your site. I stopped by just to see as sometimes I understand some coding stuff… but then I found out about the Yakezie Challenge. So thank you much and I know you will continue to rise! I have also been blogging for two years, congratulations! Thanks, Sam — I'll check out the trackback thing. I'm working out the kinks as much as I can. Looking into self-hosting. Oh btw, I don't think Blogger has a track back system, so pls e-mail those who you link to so we can come visit if it's been a day or two, and help promote! Wow, 2 years, that's fantastic! That's a great milestone. I enjoy the new look of your site. Looks like you're are in the mid 700,000 right now! Nice! I like the Google Groups we've created as a way to communicate as well. @Monevator: This is true. Today, 894,258 — woo!